A recent survey of viewers of the long-running late-night NBC sketch comedy show Saturday Night Live, reveals that many are tired of the program’s constant left-wing politics. A new Hollywood Reporter/Morning Consult poll finds that a large minority of 39 percent think that the show has gotten too political, according to Hollywood Reporter. Perhaps unsurprisingly, the split is more obvious when broken down by political party. 53 percent of Republicans said that the show is too political while 60 percent of Democrats say they do not mind the political direction of the show. Not many viewers are fooled about the show’s political leanings, either. 48 percent say the show is definitely liberal. Only a scant five percent think it is conservative while a tiny ten percent don’t see any identifying political leanings. Also, 68 percent of respondents agreed that the series constantly makes “political statements,” while only 9 percent thought there was no political point to the show. It also seemed that a large number did not want to see politicians as guest hosts. 37 percent said they would not like to see a politician host the show while 32 percent said the show could be “more entertaining” if a politician were to be chosen as a guest host. The split was similar on political sketches. 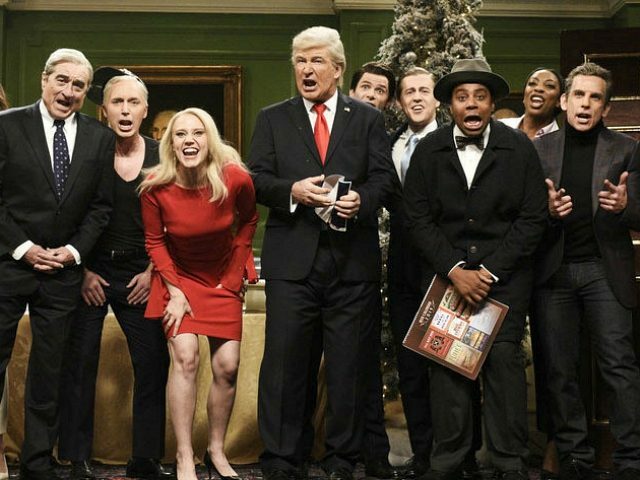 35 percent said the show is better without politics while 37 percent said it is “more entertaining” to have sketches with political themes. Finally, an even larger minority said that they would be more likely to watch the show if it dumped the politics. 41 percent said that they would prefer jokes to be non-political while only 22 percent wanted more anti-Republican jokes. Six percent wanted more jokes slamming Democrats. The poll was conducted from March 7 to 10 among 2,201 adults nation-wide.